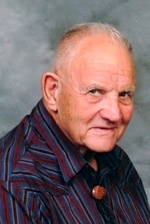 E. Gene Jesberg, 88, of Gardner, KS, passed away Jan. 2, 2017. Mass of Christian Burial 10:00 am Fri., Jan. 6, 2017 at Divine Mercy Catholic Church, 555 W. Main, Gardner, KS. Burial 1:30 pm at Resurrection Catholic Cemetery, Lenexa, KS. Visitation 5:00 to 7:00 pm Thur., Jan. 5, 2017 at Bruce Funeral Home, Gardner, KS (913) 856-7111. Rosary follows the visitation. Memorial contributions may be made to the Divine Mercy Catholic Church Building Fund. E. Gene Jesberg was born Aug. 28, 1928 in Guthrie, OK. He married his beloved wife, Dorothy Hoehn, on June 25, 1949 at Holy Trinity Catholic Church in Lenexa, Kansas. Gene was a local 41 Teamster for 30 years and was a truck driver for Crooks Terminal Warehouse until 1980. He then went to work for the city of Lenexa in swimming pool and building maintenance. When he retired in 1986, he started The Bug Warden pest control. In 1990, when he retired from pest control, Gene and his wife Dorothy bought their “dream” farm in Wellsville, KS and raised cattle for 24 years. In 2014, they sold the farm and moved to Gardner, KS. Gene loved to fish and made several fishing trips to Canada. He was a member of Divine Mercy Catholic Church, Gardner, KS. Gene was a 4th Degree in the Knights of Columbus. He served on the committee and was committee chairman for Holy Trinity Boy Scout Troop 181 in Lenexa, KS. He served as Assistant Scoutmaster and Scoutmaster for Troop 181. Gene loved to sell his baked goods, canned goods and fresh vegetables at the Farmer’s Market in Paola, KS. He will be dearly missed by family and friends. He was preceded in death by his parents. Gene leaves behind his wife of 67 years, Dorothy; son, Michael and wife Dawn Jesberg, Spring Hill, KS; four grandchildren: Jeremy Jesberg and his wife Melissa, Paola, KS, Ethan Jesberg, Lawrence, KS, Shannon Jesberg, Gardner, KS and Samuel Jesberg, Spring Hill, KS.